Often, an important new book is said to be “thought-provoking.” James Bridle’s New Dark Age aims to be literally thought-provoking—one of the book’s central contentions is that we have entered a new, dimly lit era, engendered by proliferating technology in every walk of life, which has clouded our ability to see and think clearly. Acknowledging this actual state of affairs, Bridle believes, is a necessary first step toward coming to grips with our current reality. A thought-provoking look at our current predicament. Photo: Amazon.com. 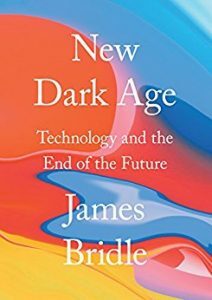 “We know more and more about the world,” Bridle writes, “while being less and less able to do anything about it.” New Dark Age traces this information overload (which produces confusion rather than knowledge) to computers and concomitant technology, and to our faith in and dependence upon technology in general. We have collectively bet that technology was our future, Bridle notes, and have thus effectively foreclosed that future (hence the book’s subtitle). Instead of a technology-driven golden age, we have today’s world of increasing environmental threat (to which server farms contribute significantly, BTW), political dysfunction and communications devolution, including the increasing inability to distinguish truth from falsehood. Trump and Brexit are but symptoms, and everyone is affected to a greater or lesser degree. To some extent, the author believes, this new darkness can be a positive development, if we will only acknowledge it. We need to understand that we are unable to understand if we are to regain the agency we require to move forward. We need to stop believing in technology without question and start questioning it instead. We need to think about every aspect of what we are doing. Bridle, who is a visual artist as well as a writer and technologist, provides numerous examples of technology gone wrong, from rogue algorithms that create pornographic cartoons aimed at children on YouTube to growing surveillance here and abroad to the increasing threat of widespread automation. Facebook is a timely and accessible example. Apart from the role it played in helping to make Trump president (see: Cambridge Analytica), apart from the role it continues to play in fostering turmoil, apart from the self-contained, reinforcing bubbles of “likes” it places its users in, thereby underscoring social and political division, Facebook has an addictive quality for many of its users which may be even more insidious. And, by its very nature, it encourages the superficial while discouraging concentrated thought. I still have a Facebook account, though I very seldom use it. Yet I have dear friends who practically live on the platform. My interactions with them on Facebook are akin to seeing them a block away in the city, headed in the other direction, and giving them a cursory wave. Facebook is distancing, despite its promise of making it easy to “keep in touch.” I will probably post a link to this review there, although it is essentially pointless, simply a habit because Medium makes it easy to do. Likewise with Twitter. If I take New Dark Age to heart, I’ll need to stop doing that. To sum up: if you’re feeling overwhelmed by life in general today, try to make time to read this book and, especially, to think about what you’ve read. It doesn’t provide many answers but it will help you view today’s problems from a different and more conscious perspective, which is certainly a step in the right direction.